Gold isn't just lovely in jewelry; it has long been used as medicine. Modern medicine is particularly focused on nanoscopic gold, which can be used as a contrast agent and in the treatment of cancer. In the journal Angewandte Chemie, Eugene R. Zubarev and his team at Rice University in Houston (Texas, USA) have now introduced a new pretreatment process for gold nanorods that could accelerate their use in medical applications. How can tiny rods of gold help to fight cancer? Cancer cells are more sensitive to temperature than healthy tissue, and this fact can be exploited through local heating of the affected parts of the body. This is where the gold nanorods come into play. They can be introduced into the cancer cells and the diseased areas irradiated with near-infrared light (photoinduced hyperthermia). The rods absorb this light very strongly and transform the light energy into heat, which they transfer to their surroundings. Gold nanorods are normally produced in a concentrated solution of cetyl trimethylammonium bromide (CTAB) and are thus coated in a double layer of CTAB. The CTAB is only deposited onto the surface, not chemically bound. In an aqueous environment, the CTAB molecules slowly dissolve. This is problematic because CTAB is highly toxic. Simply leaving out the CTAB is no solution because without this coating the nanorods would clump together. In order to make the rods stable as well as biocompatible, various more or less complex methods of pretreatment have been developed. However, for many of these processes, it is not known how much of the toxic CTAB remains on the nanorods. Another problem is that the pretreatment can disrupt the uptake of the nanorods into cells, which drastically reduces the success of photothermal cancer treatment. Zubarev and his co-workers have now developed a new strategy that solves these problems: they replaced the CTAB with a variant that contains a sulfur-hydrogen group, abbreviated as MTAB. With various analytical processes, the scientists have been able to prove that the CTAB on these nanorods is completely replaced with an MTAB layer. The MTAB molecules chemically bond to gold nanorods through their sulfur atoms. They bind so tightly that the layer stays in place even in an aqueous solution and the rods can even be freeze-dried. They can be stored indefinitely as a brown powder and dissolve in water again within seconds. Tests on cell cultures demonstrate that MTAB gold nanorods are not toxic, even at higher concentrations. In addition, they are absorbed in large amounts by tumor cells. 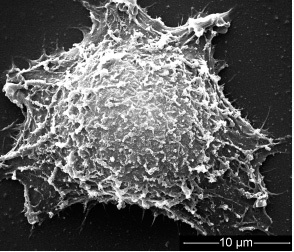 The scientists estimate that under the conditions of their experiment, a single cell takes up more than two million nanorods. This would make effective photothermal tumor treatment possible.